The effective design and analysis of experiments in biology are critical to success, yet graduate students in biological and medical sciences typically receive very little formal training in these steps. 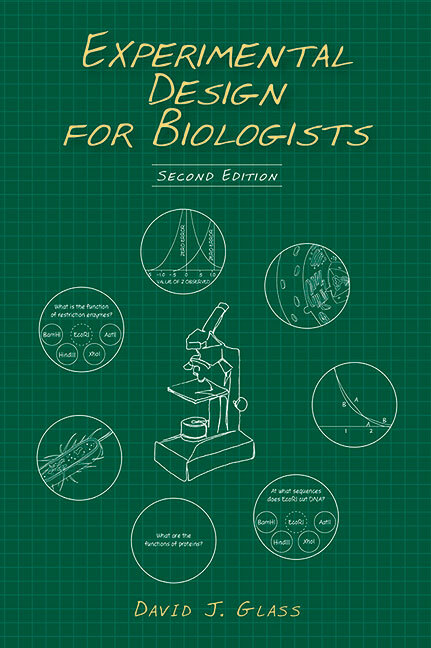 With feedback from readers of the first edition, colleagues, and students taking the very popular experimental design courses taught by the author, this second edition of Experimental Design for Biologists retains the engaging writing style while organizing the book around the four elements of experimental design: the framework, the system, the experiment, and the model. The approach has been tested in the classroom, where the author has taught numerous graduate students, MD/PhD students, and postdoctoral fellows. The goal of every scientist is to discover something new and with the aid of Experimental Design for Biologists, this task is made a little easier. This handbook explains how to establish the framework for an experimental project, how to set up all of the components of an experimental system, design experiments within that system, determine and use the correct set of controls, and formulate models to test the veracity and resiliency of the data. This thoroughly updated edition of Experimental Design for Biologists is an essential source of theory and practical guidance for designing a research plan. 7. The Hypothesis as a Framework for Scientific Projects: Is Critical Rationalism Critical Enough?